Made with Year 2 children at Sacred Heart Catholic Primary School, Luton. The children made drawings of items and subjects they wanted to include, made card templates, carved designs on the resulting plywood shapes, and planned the colour scheme for all the shapes. 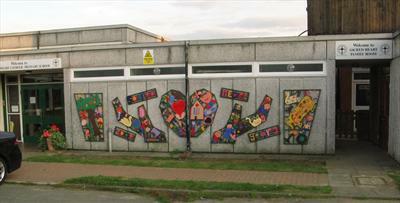 I then assembled the shapes onto supporting frameworks and fitted them all to the front wall of the school.